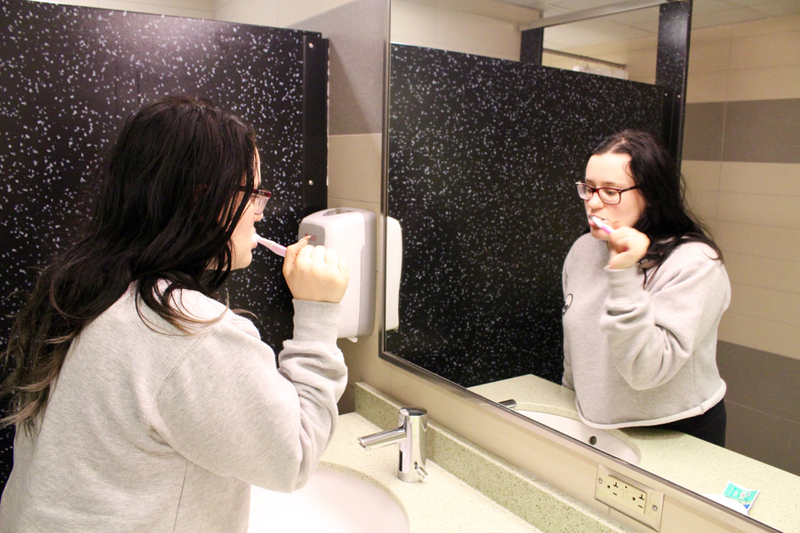 A Duquesne student brushes her teeth in her dormitory. The PWSA recently gave Duquesnes water a clean bill of health when it comes to lead content. After Flint, Michigan made headlines in January for the high amounts of lead in the small rustbelt city’s water supply, cities across the United States, including Pittsburgh, have faced questions about their own water safety. Three months ago, The Duke set out to test the water quality on Duquesne’s campus, and received reassuring results. Despite the fact that the Pittsburgh Water and Sewer Authority recently found 14.7 parts per billion of lead in Pittsburgh’s water, just under the EPA’s safety threshold of 15 parts per billion, Duquesne’s water is safe for cleaning, cooking and drinking. In February, Duke staffers sent a sample of water from an Assumption Hall bathroom and a sample from Brottier Hall to the PWSA for a free lead test. Last week, both samples were confirmed to have a safe amount of lead, according to a PWSA spokeswoman. Duquesne’s Director of Maintenance Dana Miller said Duquesne’s water lines are replaced “when determined to be appropriate.” The latest water main replacement was in 2014. The Environmental Protection Agency suggests that schools sample their water systems 50 times every three years, to test for lead and other contaminants. The EPA also suggests that when using water from older pipes, people should let the water run until it is cold before drinking it. This is to make sure the water which was sitting in the pipes, which would have collected residue from pipes, is flushed out first. Cities with old pipes often have higher risks of lead poisoning. Assumption Hall, one of the oldest buildings on campus, opened in 1950 and Brottier followed in 1969. According to the Centers for Disease Control and Prevention, lead poisoning can lead to learning and development problems, as well as physical symptoms like high blood pressure, vomiting, or muscle pain. The World Health Organization’s website says that lead in the body is distributed to the brain, kidney, bones and liver and then stored in teeth and bones. Basu will be hosting an event on campus Friday with Marc Edwards, the man responsible for the investigation into Flint’s lead-toxic water. Edwards is an environmental engineering professor from Virginia Tech who put his own money into a 2004 inquiry with the Washington Post into the nation’s water supply. He challenged the CDCP to expose that it was unclear on the risks of lead poisoning to children. The public is invited to hear Edwards speak at 3 p.m. in Bayer Hall’s Pappert Lecture Hall.